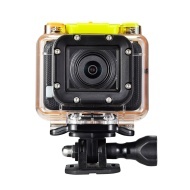 alaTest har samlet og analysert 12 anmeldelser av GoXtreme Wi-Fi 4K Endurance Action Camera. Gjennomsnittlig rangering for dette produktet er 4.4/5, sammenlignet mot en gjennomsnittlig rangering på 4.1/5 for andre Videokameraer. Vi analyserte bruker- og ekspert rangeringer, produktalder og flere faktorer. Sammenligned med andre Videokameraer blir GoXtreme Wi-Fi 4K Endurance Action Camera tildelt en total alaScore™ på 89/100 = Meget bra kvalitet. Great value and plenty of accessories. Good value for the money, came with plenty of accessories to let you get the right angle for your movie. Easy to use and good battery life. Great little camera, good accessories, good picture and great quality at 2.7 k hd doing sports or mountain biking as I do, really pleased with it. We bought this for our teenage son, and he loves it! Easy for him to set up and use. Comes with everything you need.